It’s no secret I like Peeps. In fact, I think they’re close to candy perfection – sugary marshmallow interior plus granulated sugar exterior… how can one go wrong? It goes without saying that when I saw the Just Born booth at the All Candy Expo I made sure to make a pilgrimage into those hallowed environs. When I arrived at the booth, I saw something that intrigued me – brown squares which looked quite marshmallow-y yet carried a distinctive brown hue. What was this? Something new? I had to know! I was served one of the brown squares on a napkin, took a bite, and was immediately transported to another dimension of yumminess. Oh. My. God. These were so good! Unbelievably soft, full of chocolate flavor… I had to have more! I immediately asked if they had any samples to take home, and was presented with a coveted pre-release package of brown bear shaped marshmallow goodness. 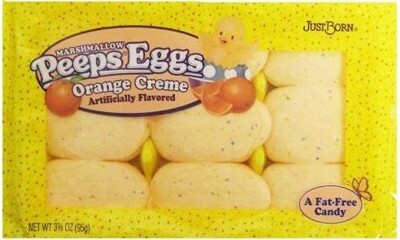 It seems I may be one of the few people in the world who actually likes Just Born’s Peeps. I mean, sure, most Candy Addicts will pop a few at Easter just to say they did, but come on, who would really eat more than two? Whilst on an emergency Listerine run to CVS today (which I hate to do because it costs, like, twice as much as Target but hey, a self-proclaimed Candy Addictâ€™s gotta take care of her pearly whites â€“ oral care is no joking matter, my friend), I somehow managed to find myself â€“ gingivitisâ€™s enemy in arm â€“ wandering down the Christmas aisle, looking for a holiday treat. Scanning the shelves, I weighed my seasonal options: Chocolate snowman? Boring. Reeseâ€™s Christmas tree? York snowflake? I do love candy with a festive shape, but not today. Candy Cane Hersheyâ€™s Kisses? 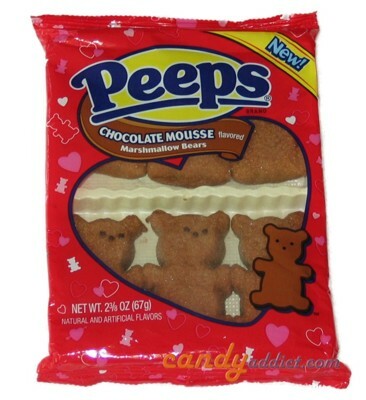 Intriguingâ€¦ Gingerbread Man Marshmallow Peeps? Sacrilege! Oh the fury! The rage! The adorable, delicious rage! Having a popular candy blog does have its rewards. One of them is unexpected free candy in the mail. Today I came home to a package from Just Born, makers of Peeps. Inside was a package of brand new Peppermint Peeps, coming soon for the Christmas holidays. 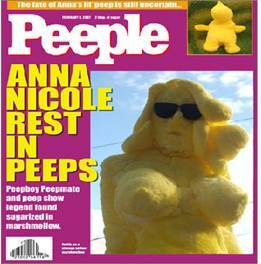 I have to be honest though – I have never been a big fan of Peeps. I don’t hate them, and can eat them if I must, but they aren’t something I’d ever buy for myself to eat. They’re just not really my thing. I’m also not crazy about candy cane peppermint flavor either. If I buy something minty, I usually go for wintergreen or spearmint. 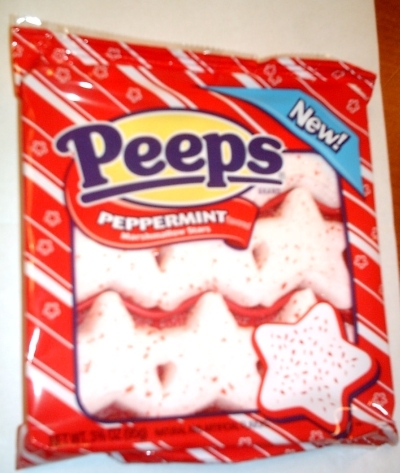 So I wasn’t sure about the Peppermint Peeps.